Check out some of our past rescues and Happy Tails from 2014! Rosie is doing well and settling into her new home with her new brother, Rowdy. Her mom says they are like two peas in a pod. It was a long road to her forever home for Rosie. She came to the Chicago area via Quincy K-9 Connection after Anne contacted Australian Cattle Dog Rescue of Illinois. She spent some time with the rescue in Southern Illinois before her new mom saw her on a posting by the rescue and fell in love. Her family had planned on going to Colorado for Thanksgiving but instead she came to Illinois to meet Rosie. Rosie came back to the Chicago area for a meet and greet before going home with her mom's family. She is now living happily ever after in Colorado. A true rags to riches story - this boy was adopted in 2009 and we continue to get updates. He was so lucky to have hit the jackpot and is living the good life! ﻿Just wanted to let you know that our hearts are full. Buddy is the perfect dog for our family. He is socializing with the other dogs in our life so well. He's doing great with the training I've begun with him here. He's clearly getting more and more comfortable each day. We haven't left him yet and he's been sleeping with us, but when we work on crate training he does great. Thanks so much to you and your family for fostering him and taking such good care of him. He is a great dog, and we feel so lucky. The mom is about 2 years old. She is very sweet and likes attention. She also has, as you can tell by the pictures, 6 cute little side kicks. ALL MALES They were abandoned in this cold weather to fend for themselves. They are only about 5 days old. This is why you do what you do :-). Love the old lady! Forrest is wonderful! About 3 weeks ago, he was neutered and at the same time he had 3 teeth extracted. He never stopped wagging his tail, all the Vets and staff are in love with him. He took his meds like a champ for two weeks. Last Sunday he had his post-surgery follow up, and in a word, PERFECT. He is definitely mixed with a Newfie, the vet said they have that extra, huge, dew claw, which Forrest has. Can't wait to get him in the water next summer!! His dog walker says he is fabulous on a leash and friendly to everyone and every dog. Sigh still doesn't let him up on the bed, but they share toys and nap together. But that means that Forrest has his own bed, in the guest room! His nickname is Run, Forrest, Run! Or simply RFR ! Sigh and I are so lucky to have found him and we cannot thank you enough for what you did for him. I cannot thank you enough for the work you do. God bless you for all you and your volunteers do. What an amazing undertaking; and to think you do it weekly! When I picked up Bailey she was so scared. She was so overwhelmed it was hard for me to get her to go outside; she just wanted to get back in. I knew it would take lots of love and time to get her over this and I couldn't bear to uprooting her again. She is so sweet. We love her to death as you could see by the picture of her with my husband- there was no way he was letting her go. Thank you from Bailey and all the other animals you've saved. VERY SPECIAL ADOPTION:Naturally every adoption is cause for celebration, but there are some placements that stand out more than others. One such adoption is Calla, an 8 year old Pointer we selected to transfer from a high-kill animal control facility in spite of her having heartworm disease, hookworms, and testing positive for both Lyme disease and Erlichia (tick-transmitted diseases). When originally found, she was also malnourished, full of fleas and ticks, and was so weak she collapsed on the side of the road. She needed us. We placed Calla in a loving foster home for 6 weeks where she received lots of TLC, nutritious food, and specialized medical care. She gained 10 pounds, too After being back at the shelter and up for adoption for only a few days, a very nice retired couple came in inquiring about another dog, but who was being adopted. They then asked about Calla and were very touched by her sad story and surprisingly were not discouraged by her need for additional long-term medical care or her age. They fell in love upon meeting her and decided to take her home. We could not be any happier or any more proud of our involvement in this sweet girl's rags to riches story and happily ever after ending! Tootsie is doing really well. Here she is with her new pal. They also renamed her Schotze. Gracie is happy in her new home! Docker was adopted in October, 2014 at the Great Lakes Border Collie Rescue Reunion picnic! "Thanks for everything. He has been playing frisbee all morning with Erik. He is such a friendly boy. Everything is going well and the cat is fine with him. I will take him to the vet later this week to transfer his records. The picnic was such a nice event and I enjoyed meeting all the people involved with the program and the owers. I hope to make it back next year!" You sent me a dog named Simba a couple of weeks ago. My foster home wants to adopt him. If you keep sending me such good dogs I am going to run out of foster homes! Here is a picture of Will (far right) in his new foster home. He was very good on transport. Sissy is happy in her new home! Thought you'd appreciate this picture of Brutus helping our receptionist greet visitors and answer the phone! My brother and his wife are coming in tomorrow to see if he'd be a good match for them and their current dog. Fingers crossed! Ian & his buddy Brandi. Just wanted to share the great news that little Paco was adopted today!!! Henry is a busy little boy most of the time; he either goes out in the yard, surveys the land to make sure he lets everyone who passes by on foot knows he is there. The one pic of him on the couch depicts his, let's hide mode.I don't know if you have ever heard him howl, but he only does it when he hears a siren of some kind (police/ambulance) & he does not do it any other time. He has enough energy for several dogs but when he is ready to rest, he rests! He is like my little velcro dog as he will follow me anywhere I go in the house. All I can say is he is one of a kind, smart, stubborn, sweet, a character & just the opposite of Abby in temperament in many ways; she is so layed back & due to age, more sedate. I had to smile when the little boy snapped the leash on Murphy and said "this is the best day of this dog's life!". I think he was right! SO sweet!!! Holly has been adopted & being spoiled rotten! Duchess & Skidder are two little sweeties! They are very lovable girls who have gotten attached to me quickly. We are heading to an adoption event today. Got them new matching harnesses and I am hoping they will be a big hit! Thanks for letting me help them out. Lizzie is really doing well and we enjoy her more each day. She loves riding in the speed boat sitting in the back jump seats at forty miles per hour with her nose to the wind. When we head down to the lake she runs full speed ahead back and forth several times really getting a great workout. I did pay a visit to the vet this week and all is good news. She is up to thirty four pounds and I think that it is a good weight for her. The reason for the trip was that her nose was still not healing correctly so had it checked and they found bacterial growth on her nose. SOOOO she is on antibiotics and a cream for the nose. It is really looking great already and it has only been two weeks. She gets along with all our grand puppies when they are here and all neighbor dogs. Piper (formerly Gloria) is getting along great with our bluetick! We are happy to have her in our family!! One week ago yesterday, we brought Lucky (formerly Belle) home. She is an incredibly sweet & loving dog. She is great with both kids and is an awesome walking/running companion and a snuggle buddy. Thank you so much for taking her in from another shelter and for everything that you do. We are very grateful! I met Macy today at her foster mom's house. I just had to email you and tell you she is a wonderful dog! She is doing great with Kayla and her boyfriend so much, that they are thinking they may adopt her themselves. Macy especially likes Kayla's boyfriend. They both love Macy a lot and say she is the easiest dog they've ever fostered. I hope they decide to keep her. She is beautiful and what a sweetheart she is. Thanks for saving her! There was something in her picture that made me want to rescue her. I thought her name was Sissy but it was Sassy. Now it is Elsa. She has an appointment for July 8th to be spayed and she is officially registered with her rabies shot. This is my daughter with "her" new puppy she says she has been waiting for years for. She is so good with her too. Elsa gets so excited to see her when she enters the room. Rhea wants to take her everywhere. She is so great on a leash and very calm so my 40lb daughter has no problems holding the leash. The dogs all get along great and the cats don't mind her. Thank you for all you have done. Remmie in her furever home! My friend who was interested in her adopted her after she was spayed. Brought her home last night! She has a step sister, Bailey, and lives in a great home in the south suburbs. YAY!! I am impressed with her. She was very lethargic last night - This morning, however, she blossomed. She has eaten a lot. Has gone out several times and done her business. And I am floored at how well she is doing. She is trying really hard. We love her and she will be so spoiled in her new home, I am grateful. About 30 minutes ago, she went outside and found the spot the other dogs use for their business and did it there! Smart girl. She is a complete love. Thanks so much for helping else make this work! Sweet Annie was adopted to her forever home and the best part is that the family adopted another little buddy to be part of the family as well. Annie and Max were friends while in rescue and now they are in their forever home together. I transported little Max from KY so I am thrilled for Max and Annie. One of Jemma's puppies is going to be a service dog! I am so proud!! Here is a picture of him in his cape... AWESOME!!!! As you can see, Butch is settling in pretty nicely at his foster home!!! Just wanted to say thank you again for allowing us to pull Annie. Here is a pic from her foster Mom. She is loving life and such a happy girl!! Jemma before & after - She is still HUGE!! I have lots of pictures! Thank goodness the vet was wrong when he told me her milk was going to dry up and I should be prepared to bottle feed. She has enough milk to feed a small herd!!! 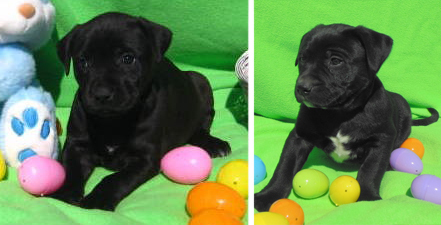 I just had to share the most recent pictures of Jemma’s (formerly Lady) pups. They are all nice, sweet pups! After being turned away from the shelter for being Heartworm positive, Quincy K9 Connection incurred a huge chunk of change (we all know heartworm treatment isn't cheap) to treat Henry. He was fostered by one of our local volunteers, then taken in by a QK9C volunteer in Chicago to foster for K9 Lifeline and has now been ADOPTED BY HIS FOREVER FAMILY!!!!! Yipppeee Dippeee!!!! Henry was worth every penny...knowing he is happy and loved is what QK9C is all about!!! Thank you all for helping Henry find his forever home! "Henry is doing great, what a nice boy. Adopters are coming to meet him tomorrow morning, and I’m expecting them to take him home with them. I can’t imagine they won’t love him on first site. ... My Pointer, Isabel, is going to miss him. They have become great friends, and have fun playing in the yard together." 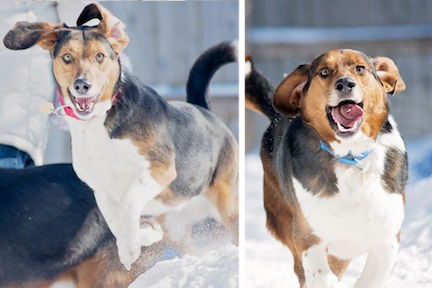 -Henry's foster mom, Karen D.
I think they like the snow! :) I thought you'd like to see these pictures of them. They make me smile. They were so sad and depressed in the shelter - this is what it is all about! A feel good for you. This is Gracie and the owner's granddaughter. Gotta love it - no one wanted to rescue her, then Donna finally agreed to take her....now look at her!!! This is when we know that all the stress and time we devote truly makes a difference. I thought you might to see a little photo collage that I put together to show how Chuckie who is now Yogi has changed over the past few weeks. Thanks again for giving him a bath and cutting out his hair mats before I met you on Jan 9th. The pictures in the collage with today's date are from after his spa treatment, aka groomer visit. He smells soooooo good and his fur is sooooooo soft. The color of his coat is much better too and it'll continue to get better over time. You can also see his nub of a tail now. I think he looks quite handsome and he is all spiffed up now. I also think he looks younger than he did in his initial pictures. He has a dental appt set up for next Monday. He definitely needs that because he has a lot of teeth that are partially or fully broken off. "Glacier is an awesome dog. We have someone coming to see her this afternoon if the weather does not get worse." She is fantastic. I had someone interested in another dog but that dog got adopted so I mentioned that Glacier was coming today. It was love at first sight. Glacier was adopted later that day!! Here's a cute picture of Elvis!